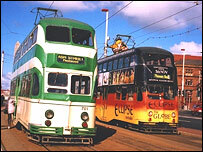 BBC NEWS | UK | England | Are trams at the end of the road? Are trams at the end of the road? Long-awaited tram schemes for three areas of England were scrapped within four weeks of each other in November. The government was criticised for withdrawing support and funding in an age when people are being encouraged out of cars and into public transport. The schemes for Merseyside, Hampshire and Leeds were claimed to be vital for those three places. 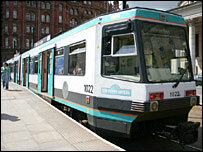 The Department for Transport said it was not "anti-tram" but could not support the schemes when costs rose. But transport groups and tram enthusiasts have criticised the government for cutting funding while continuing to back road schemes. On Merseyside authorities said trams were vital for regeneration and Merseytravel is seeking a judicial review into the government decision not to release the £170m previously promised to help fund its scheme. Hampshire County Council has asked the government to explain how it should cope without trams when its population will increase because of government house building plans. Leeds City Council said the proposed scheme there would have been the best way of dealing with congestion in the city, which it claims is the largest in Europe without trams or a light railway. Councillors reacted angrily to the government's withdrawal of support, with deputy leader Andrew Carter going as far as to say: "This government has let down the people of Leeds and this council in a way that no government has ever let down an area of the country before." Tram or light rail systems already exist in a handful of English towns and cities, including Manchester, Sheffield, Nottingham, Birmingham, Newcastle, Blackpool and the Croydon and Docklands areas of London. 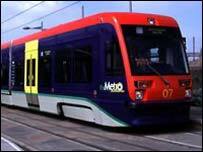 Government figures show journeys made on light rail systems have increased by 130% in the past 10 years - with an 8.4% growth during 2005. The government says it has contributed about £700m to such schemes since Labour came to power in 1997. Transport secretary Alastair Darling said: "We have always recognised that trams can be very effective in heavily trafficked areas. "We will continue to be prepared to support trams, where they are the right solution. "But we will not do so at any cost, and in many cases a well designed and promoted bus-based system is likely to provide a more cost-effective solution." Transport 2000, an organisation which promotes the use of public transport rather than cars for environmental reasons, said there was an inexplicable difference in government approach to road schemes and tram schemes. Meera Rambissoon, the group's public transport campaigner, said: "It really doesn't make sense. Despite the fact a lot of road schemes across the country are escalating in cost, the tram schemes escalate in cost and they are scrapped." The country's light rail systems were debated in the House of Commons the day after the Hampshire and Merseyside schemes were scrapped. Paul Rowen, Liberal Democrat MP for Rochdale, a constituency which includes part of a proposed extension of the Manchester Metrolink, raised the issue. Condemning the rejection of the three new tramway projects, he said: "How different that is from the 10-year transport plan of 2000, which envisaged 100% growth in the number of people using light rail, with government support for 25 new schemes. 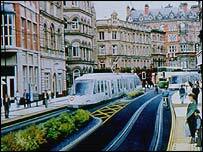 "The secretary of state for transport has repeatedly said that tram schemes cannot be funded at any cost. Why does the department not apply the same logic to other transport schemes? "The Hampshire and Liverpool light rail schemes are scrapped because of cost overruns of 26% and 40%, yet I understand that trunk road schemes are now averaging a 53% cost overrun." During the debate Conservative MP John Hayes claimed the government had spent £284m on schemes that 'have come to nothing'. Brian Lomas, of the Light Rail Transit Association, said: "Really, the MPs that spoke said pretty much what we say - basically the government is quite rightly worried about increases in costs but quite a lot of these costs are imposed by the government themselves." Mr Lomas said a complex system of bidding used by the government, the need to put in place contingency plans in case of delays and the actual length of time it takes to bring a scheme to fruition all added to the costs. He said: "I've lost count of the number of years Leeds has been going on for, of course they are spending money all this time. "It takes on average about 15 years to implement a scheme in this country, whereas in France it's about five years. "In the longer term there's very little difference in cost between trams and buses, trams are more expensive to put in originally, but they tend to last longer. "MPs of all parties said other things were increasing in costs including road schemes, and yet it's light railway that seems to come under scrutiny. All we ask for is a level playing field." Do trams beat the jams?